2017 Annual Meeting October 8th! The first known burial in the Chesterville Cemetery was Andrew Anderson (1818-1898). On February 18th, 1911 the three hundred feet square property was transferred from Robert B. Wallace to the Chesterville Cemetery Association of Chesterville, Texas to be used for cemetery proposes only. 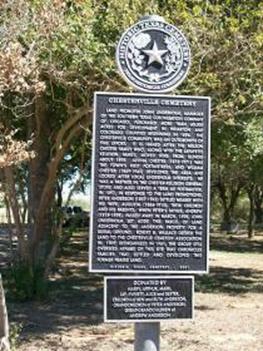 The cemetery serves the community of Chesterville in Colorado and Wharton Counties. The Chesterville Cemetery Association is dedicated to the upkeep and preservation of the cemetery. Members are descendants of those buried in the cemetery or are residents of the Chesterville community interested in the preservation of the cemetery. 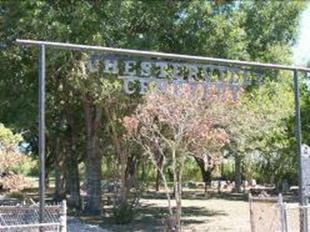 In 2001 the Chesterville Cemetery was the first cemetery in Wharton County to receive designation as a Historic Texas Cemetery by the Texas Historical commission. A pavilion was constructed in 2011 in the memory of Anita Schmidt LaPorte and is used to host meetings and funerals. The Chesterville Cemetery Association follows the guidelines and standards of the Texas Historical Commission’s RIP Guardian Program in managing the maintenance and preservation of the Chesterville Cemetery. The Chesterville Cemetery Association annual business meeting is held at the cemetery on the 2nd Sunday of October. In recognition of Texas Cemetery Visitation Days a workday is scheduled for the first Sunday of April. Friends and family are invited to work on cleaning up their family plots and helping with general cemetery cleanup and maintenance. Please contact the association to confirm date and time. Donations are appreciated, please contact us for information on how to make a contribution to the maintenance and preservation of the Chesterville Cemetery.